FILE - Islamic State group militants hold up their flag as they patrol in a commandeered Iraqi military vehicle in Fallujah, Iraq, March 30, 2014. The United States Friday sanctioned three members of the Islamic State who were featured in a beheading video distributed by the group and accused of luring recruits in Southeast Asia. The United States on Friday designated three individuals from Southeast Asia as terrorists for allegedly recruiting people to join the Islamic State (IS) terror group. A statement from the U.S. Treasury Department said Mohamad Rafi Udin, a Malaysian, Mohammed Karim Yusop Faiz, an Indonesian, and Mohammad Reza Lahaman Kiram, a Philippine, were also featured in a June 2016 IS video, in which they beheaded three prisoners held by the terror group. 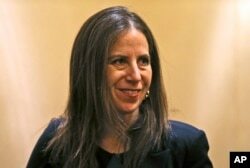 “Treasury is targeting ISIS recruiters who have engaged in a beheading video and other brutal acts as part of a propaganda campaign to attract radicals to join militant terrorist groups in Southeast Asia,” said Treasury Under Secretary for Terrorism and Financial Intelligence Sigal Mandelker, using another acronym for IS. “We are sanctioning these terrorists along with our U.N. and international partners as part of a coordinated effort to counter ISIS’s global networks that enable the group to recruit foreign fighters to conduct international terrorist attacks,” she said. Sigal P. Mandelker, the undersecretary for terrorism and financial intelligence at the U.S. Treasury, talks to journalists at a press briefing in Dubai, United Arab Emirates, July 12, 2018. Udin, a former taxi driver turned Islamist militant since 1998, traveled to Syria in 2014 and used IS propaganda material to urge sympathizers to join the group and conduct terrorist attacks. He worked to unite jihadists in the Philippines under Isnilon Hapilon, the former leader of Abu Sayyaf Group, who pledged allegiance to IS leader Abu Bakir al-Baghdadi in July 2014. The second blacklisted man, Faiz, was jailed in the Philippines for nine years on charges of illegal possession of explosives and weapons. He also joined IS in Syria in 2014 and helped recruit people from Southeast Asia to join IS-linked Abu Sayyaf Group, also known as IS-Philippines Province. The third man, Kiram, is accused by the Philippines police of being responsible for a 2012 bus bombing in the city of Zamboanga. He reportedly trained IS-linked Ansar Khalifa group recruits in 2014, before traveling to Syria with his wife and daughter in 2015. All three individuals will be added to the U.S. list of Specially Designated Global Terrorists, which targets terrorists and their financing. The United Nations Security Council designated Udin, Faiz, and Kiram Thursday on similar charges, obliging all UNmember countries to prohibit their travel, freeze their assets, and deny their access to the international financial system.